Poppy’s playlist spans the centuries and is inspired by the bard himself. What to wear? Casual? Sure. Dressy? Sure. Dress as one of the bard’s character’s? Sure. As you like it. Me thinks ’tis nobler to party. Hope to see you there. Several weeks ago – in the midst of a very busy time, with events following rapidly one atop the other in several of the worlds which I visit or reside in, with side visits to some new worlds which I have added to my route – I made a quick trip to an older world (*1) that I had not been to for some time. I was headed to this world as it was once home to a number of the ages overseen by The Devokan Trust. 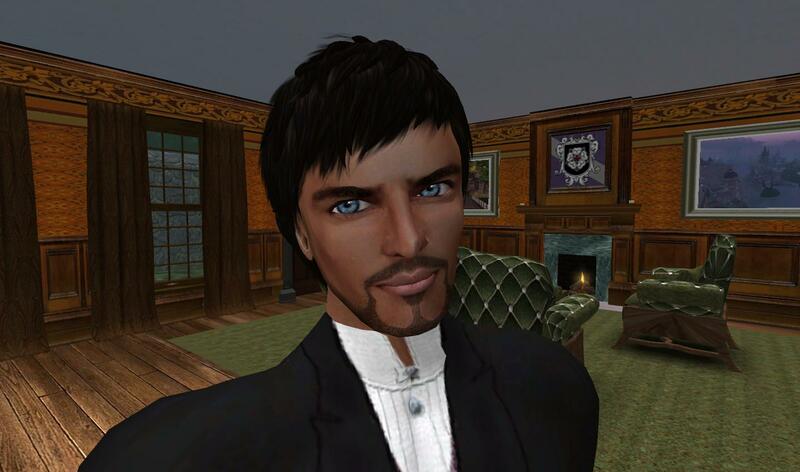 My reason to visit was my personal interest in these ages but the timing of my decision to make this trip was based on countless reports of political troubles in that world that were echoing across the Metaverse. Fortunately. these troubles have never touched on the Devokan ages even remotely but political battles can be as unpredictable as scientific experiments or exploration to new worlds and so I thought I should make this trip while it was still possible to do so. It was a difficult journey as my destinations were places that no longer existed – Deepwater and Waysmeet. Quinquifid Oddenfen, scientist and Director of The Trust, had attempted to move these ages to a more stable world. Certainly, this was a worthy experiment on his part but unfortunately there had been unforeseen complications. The result: the whereabouts of these ages was unknown at the time. My urge to visit these ages again came from my true fondness for them – they are among the first places I had seen when I went to visit Dot Macchi as her work was taking her to a place called Lost Pages in a world away from the homeworld (*2) of Winterfell, where I first met Dot and later Quin. I looked this up last night in my journal, it was about two-and-a-half years ago that I first went to see these ages. Of course, my first visit to the Tree Village in Waysmeet came many, many years before that, long before I met Dot or Quin or any of the worlds I have travelled over the past six years or so. I first encountered the Tree Village in a world called Myst nearly two decades ago. So to return to it in these times is always a homecoming of sorts. How does one plan a trip to a place or a time that is no longer where it used to be? With great care, I assure you. I reviewed my journals, going back over my previous visits and dusted off some old maps that were no longer accurate. And I reviewed my correspondence from Quin and Dot and looked over Quin’s recent reports as well. I was looking for a place or a reference to a place that might get me close to where Deepwater and Waysmeet used to be. As best I could figure, Tao Lia was still in the vicinity as I could find no reference to it being moved or lost or destroyed. Though I would not know for sure until I arrived in that world and even then, there was much figuring on how to make the time jump involved in reaching Tao Lia. Fortunately, this was one of those times when research and figuring paid off and I eventually found myself in Tao Lia, Shenn Tao’s home age. It was as beautiful and mysterious as I remembered and there were new elements since my last visit. Huge white globes or spheres floated in the air, not far off the ground. Fascinating. I watched them for a while. I got up the nerve to step toward and into one that came close. It moved through me and I through it. I felt nothing nor did I alter its course. I checked my “live map” to see if Deepwater or Waysmeet or any other remnants of Devokan ages were nearby but I was surrounded by vast ocean. This was pretty much what I expected. I looked about me and saw a linking book and familiar small, blue spheres – passage ways to other ages. I found my way to three of them…all beautiful, all mysterious…but none were the ages I was looking for. I was not surprised. as these are certainly the first places Quin would have looked once his experiment went awry. Looking again at the live map, I could see that I had never really left Tao Lia. Apparently these additional ages’ existence was a result of the “layering” I have heard Dot refer to many times. I did take my time, exploring and linking among these ages. One link took me to a place I am familiar with. It is known in Shenn’s world as The Flying Island and is the original instance of the place I know as the Sky Garden, located high above Kamar in Evergreen, the place I watch over for The Devokan Trust in another, more stable, world (*3). I used the communication system in Shenn’s world to leave him a message. We have never met but as I host three of his ages back in Evergreen, I felt obliged to contact him and thank him for his creations. Some days passed and I was at a gathering of the Devokan Storytellers group in Curiosity at which Dot told us that Quin had successfully brought Deepwater and Waysmeet to our more stable world. He also was able to reconstitute Touchstone and Skysong as well and bring all four ages together in a grouping named for The Devokan Trust. Dot did not have the details of this latest experiment, just that it had been successful. I wondered whether Quin had briefed her on the matter or if she had found this information on her own. Quin has not been back to Evergreen for quite some time now. The last time I saw him was in Future Past last fall. As I mentioned, my travels have taken me to a number of worlds in recent months and I have not been able to get back to Evergreen much myself save for dropping in for a brief check from time to time. At the first of the year, I hired a caretaker, a Mr. Zeplin, to link in twice a month to tidy up and refresh our supplies should Quin need a break from his work and head here to his study-retreat in Selenitica. I did stop in quickly today to transfer payment to Mr. Zeplin and to check on things. The visitor log showed a lot of activity as Evergreen attracts explorers, tourists and the simply curious. It was nice to sit in my room in the castle’s Observatory and look out over Kamar, Tao and Satori as I wrote this journal entry. I walked around to Quin’s retreat to make sure all was well. Just inside the doorway was a courier’s satchel. I knew Quin had not been here so I assumed it was incoming rather than outgoing. I picked it up and carried it over to his desk, where Mr. Zeplin had neatly stacked Quin’s incoming reports, though they were few and far between. I opened the satchel to find it bore Quin’s latest report, dated 1 April. I scanned it and my eyes were drawn to the final item, Quin has asked Dot to return from her sabbatical and resume her work for The Trust. I pumped my first in the air and hollered, “Yes!” I was never sure whether this sabbatical was Dot’s idea or Quin’s and I had chosen not to try to find out. But Quin’s note made me hopeful that tempers between the two had cooled to a more moderate level. I look forward to seeing Dot at the next Storytellers gathering on Sunday. I expect she’ll be in high spirits, ready to return to the work she loves. Though it’s not as if she has not kept busy during this time. She has been staying at The Trust’s Retreat in the mountains and devoting her time to a new project, a cataloging of years’ worth of journals and correspondence related to the Trust…to compile, in one place, an archive for current and future scholars and students. I have already had a look at it and plan to make use of it myself. I do hope Quin realizes what a valuable project this is and rewards her appropriately. I went back up to the castle and sat for a bit but I had to be off. I must return home to Winterfell for awhile and then off to business in other worlds. I have been so busy I have not had a moment to rest but the next time I do, it is my intention to do so in Waysmeet. To just sit and take in its beauty and not think about politics or science or exploring or time travel or the items on those To Do lists I now have scattered in several worlds around the Metaverse.